After the shooting on Feb. 14, 2018 thousands of people gathered at Pine Trails Park for an interfaith vigil to honor the victims' lives. "We do not stand idly by while our neighbor bleeds." This is a hard week in what has been a hard year for the Muñoz and the Fox-Snider families. Like many others in the Parkland community, these families are still dealing with the aftermath of the deadliest high school shooting in U.S. history. Thursday will mark one year since 17 people died and 17 others were wounded in a mass shooting at Marjory Stoneman Douglas High School. When dealing with traumatic experiences, some people turn to counsel, therapy, and anti-anxiety practices like yoga, or meditation. But for people who consider themselves religious - some turn to their God. WLRN spoke with parents of students who survived the shooting last year from Mary Help of Christians Catholic Church and Congregation Kol Tikvah. They shared what role prayer and faith have played during their family's healing. These are their stories. Leonor Muñoz was a senior at Stoneman Douglas when the shooting happened. Her mother says that physically her daughter is okay, but the event has taken an emotional toll on everyone in the family through the year. In her search for peace after the tragedy, Rocio Muñoz felt called to get involved with a different ministry at Mary Help of Christians Catholic Church: Funerals. The first funeral she helped with was for another Stoneman Douglas student, Gina Montalto. She was only a few years younger than her own daughter. Mary Help of Christians Catholic Church in Parkland. "The priests were really busy so someone had to be with the families. And I needed to be there. I was the first face that they would see," Rocio Muñoz said of the victims' families in mourning. "Having been there as a mom too, I think that we had some kind of trauma bonding in which we knew what we were feeling...but, of course, my level was never as deep as theirs," Rocio Muñoz said. "In her personality, she wants to help people out, not just do the paperwork and the transaction. She needs to connect with people," Roberto Muñoz, Rocio's husband, said. "When you connect with someone in grief, you need to do it carefully so you don't absorb the grief from them." "It's called Stuck for Words - because that's how you feel at those times," Rocio Muñoz said. "Letting people grieve their own way and giving them that space of no judgment, of peace." "If you think that you must say something ... don't." Since that class, Rocio Muñoz has helped with more than 30 funerals. She learns about the loved one that families have lost, takes notes for the priest, and helps them choose what readings fit their situation best for a mass. "So they can plan a beautiful ceremony," she said. After the shooting, the church was not the same source of comfort for their daughter Leonor, as it was for her mother. She’s been open with her parents about the fact that she’s angry with God. But that's not a bad thing, her mom says. "'You're angry with him? Yes, go and complain - tell him. Tell him that. Just keep the relationship going, even if it's fighting. Just keep it going.'" Rocio Muñoz told her daughter. She said that's what she's been doing with her own connection to God. "I think that I have distanced myself at some points. I can notice it," Rocio Muñoz said. "When I am anxious I know that I am not as close. I am forgetting to pray and I have to make a true effort - a conscious effort - to pray. It doesn't come as natural." 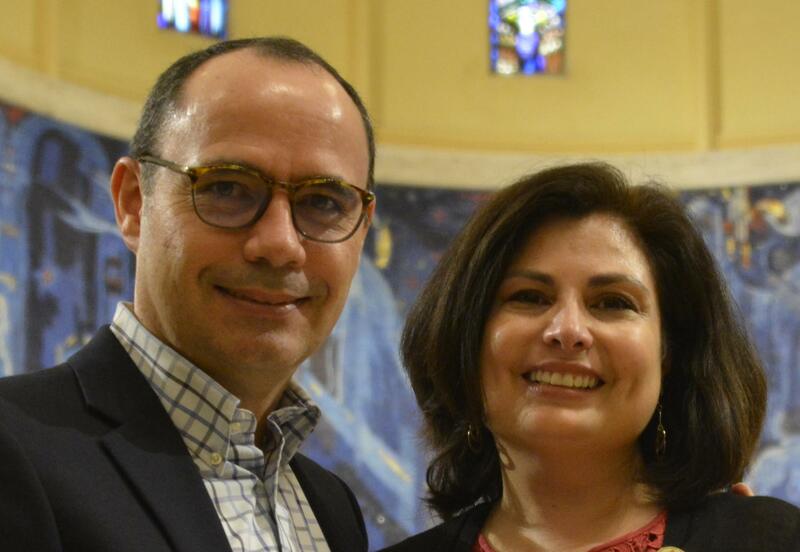 Roberto Muñoz, left and Rocio Muñoz, right inside of another Catholic church in South Florida, St. Mary's Cathedral in Miami. "I started seeing God as the best psychologist ever," she said. "That's when I started thinking about the Cross. I had never before thought about what the meaning of the cross was. Then I realized that Jesus tells us, 'Pick up your cross and follow me'. He doesn't say, 'Forget about the cross, avoid the cross, pretend it's not there.' He says, 'pick it up.'" That revelation about her faith has helped Rocio Muñoz to try and move forward, one day at a time. At the start of the next school year, Rocio and Roberto have decided to start teaching catechism classes again. "I needed to understand my grief and the grief of others," Rocio Muñoz said. When their school was evacuated on Feb. 14, 2018, a group of Jewish students walked straight to their synagogue, Congregation Kol Tikvah, looking for refuge. Ellen Fox-Snider's daughter, Zoey, was one of them. "She was walking with her friends and she said, 'I'm walking to the temple,'" Fox-Snider remembers. "She could have walked to city hall or the library here, but that's not what she knows. This is her second home." Zoey is back at Stoneman Douglas now, as a junior this year. Her mom says she doesn’t like to talk about what happened, but she has stayed active in Kol Tikvah's youth group and has been advocating for common sense gun legislation with her mom and rabbi. Ellen Fox-Snider, center, and her daughter Zoey, left, didn't stop marching for gun control measures in Florida. The family also went to Washington, D.C.
"The first thing we did as a congregation - [the] Rabbi and I, and a few other adults, and a busload of teens went up to Tallahassee a week after, and it was really a very Jewish thing to do," Fox-Snider said. "We do not stand idly by while our neighbor bleeds." Four of the victims from the shooting were connected to Kol Tikvah. Rabbi Bradd Boxman says the hardest part of the past year has been meeting people where they are in the coping process. "We're not through till we're all through, and I mean through the Valley of the Shadow," Boxman said. "We're not going to leave anybody behind." The Valley of the Shadow is from Psalm 23. It's a traditional prayer for Jewish funerals and memorial services. "It certainly has tested me to think through more of my thoughts about theology and all of that, but I think we're still living in the shadow," Boxman said about ongoing recovery from the shooting. Getting out of the valley of the shadow is what Fox-Snider's tried to do ever since her daughter survived last year. A licensed mental health counselor, Fox-Snider helped bring group programming for dealing with stress and trauma to Kol Tikvah. 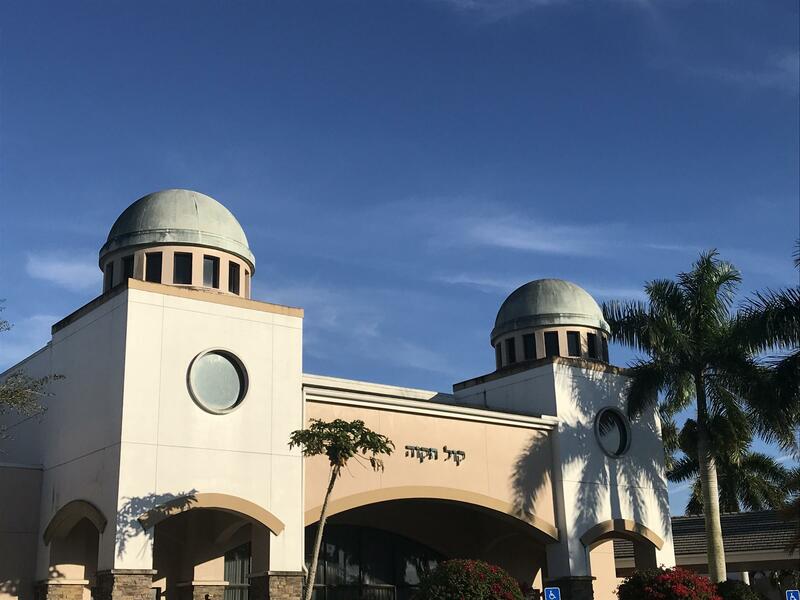 Congregation Kol Tikvah in Parkland. "Breathing techniques meditation, mindfulness…. You know a lot of the popular tag word," she said. "But the power of the [mindfulness] group is very effective and really helping people work on their own issues. In the process, I'm healing myself as well." Members at Kol Tikvah have also tried to help another synagogue in pain after gun violence. The congregation made thousands of bracelets for the Tree of Life Synagogue in Pittsburgh, where 11 people were killed during a Saturday morning service last October. "From Parkland to Pittsburgh with love, we stand in unity with you. You're not alone, we're with you." Rabbi Boxman said one of the biggest lessons he has taken away from the past year is related to that idea. "It's our obligation as human beings to feel another's pain," he said. "And to reach out, out of our own sense of loss and sorrow, to find a sense of solidarity." 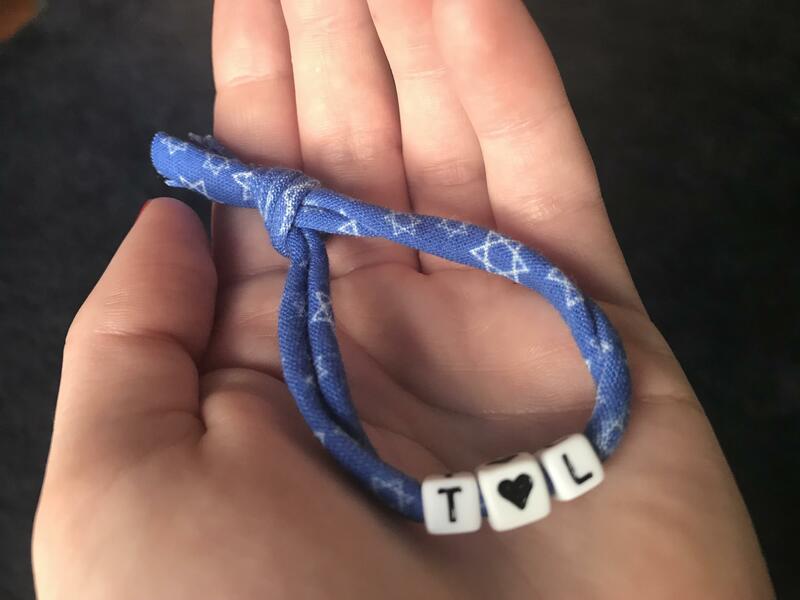 The bracelets that Congregation Kol Tikvah made for members of the Tree of Life Synagogue in Pittsburgh. The 'T,' heart and 'L,' stand for Tree of Life. 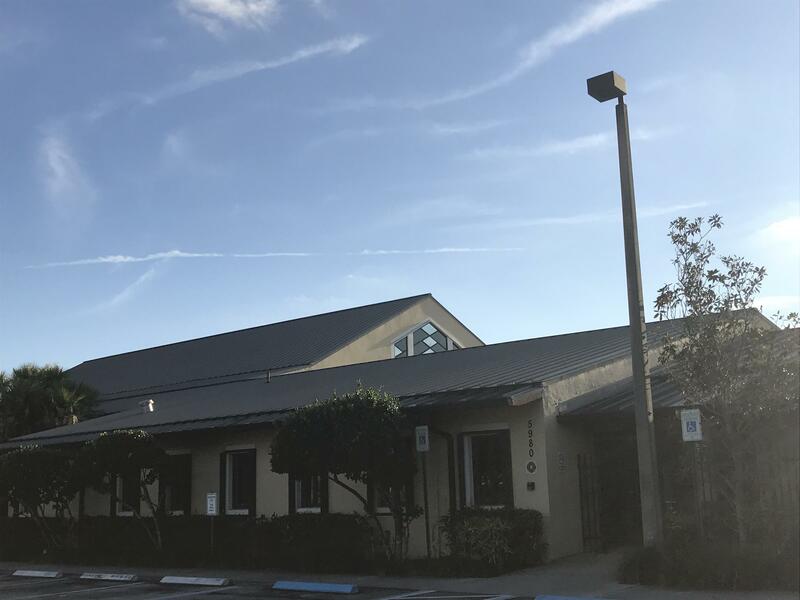 At Congregation Kol Tikvah in Parkland last week, Rabbi Bradd Boxman told the congregation there was an elephant in the room. The elephant was a prayer, or a piyyut, a liturgical poem, that has been recited during the Jewish New Year for centuries. The prayer, the Unetaneh Tokef, is about who will live and who will die in the coming year, and how. It involves asking to be inscribed in the book of life, to remain among the living. Young Survivors: The Unspoken Trauma of Gun Violence is a multiplatform series (14 radio features and interviews, online reporting, photography, illustrations, social media and a live hour) that exposes the trauma and mental health burden of communities impacted by youth gun violence. Much of the reporting we see around gun violence is about death. This project focuses on the impact of nonfatal shootings—survivors make up the vast majority of school-age gunshot victims. This is about the living.